Now here's a game that I can't imagine too many people own on purpose... and yet, here I am with a copy to review. 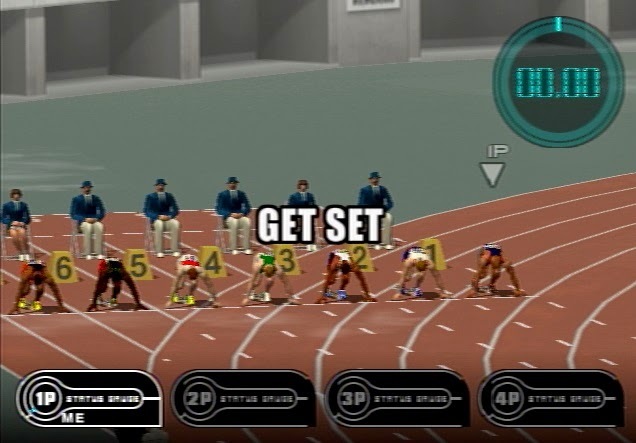 Basically, what you have here is a collection of simple minigames themed around Olympic sports. 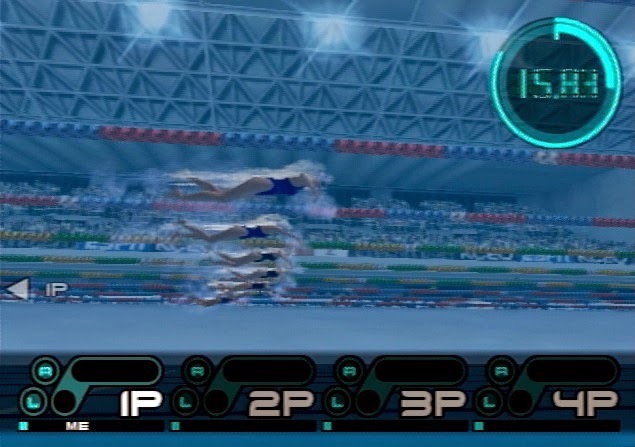 You can play the games with up to three other players (multitap required, even though most games have you taking turns anyway) or alone and compete for high scores, either one at a time in trial mode, or all in a row with championship mode. That's the entirety of the game and it offers literally minutes of fun, trust me. But before we get into the details of each game, I would like to say that this game did impress me in two ways (and only two ways). Firstly, the character animations are actually impressively good for the time this was made. Apparently they were motion captured, if the back of the box is to be believed. 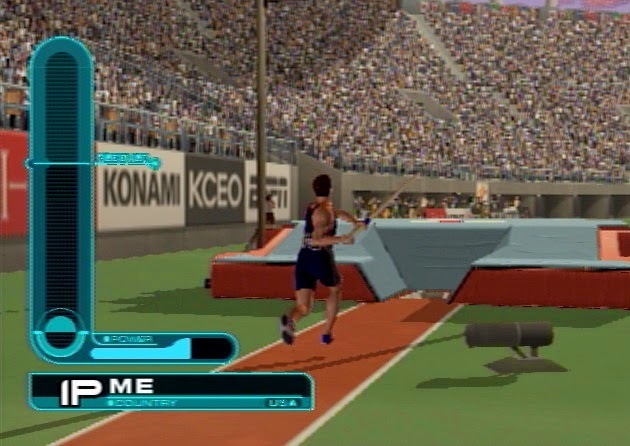 Second, there are really smooth text introductions to each event which are animated according to the sport; for example, 100m Hurdles has the words jumping over each other... so that's cute, I guess. Take a wild guess how this one is played. If you guessed "mashing buttons", you're right! In fact, seven of the ten events primarily consist of mashing X and O in alternation (which is awkward to do without re-positioning your hand to press them with two fingers). Oh yeah, also, all the starting text in this game looks like it's the same font (Impact) as the typical internet meme pic. 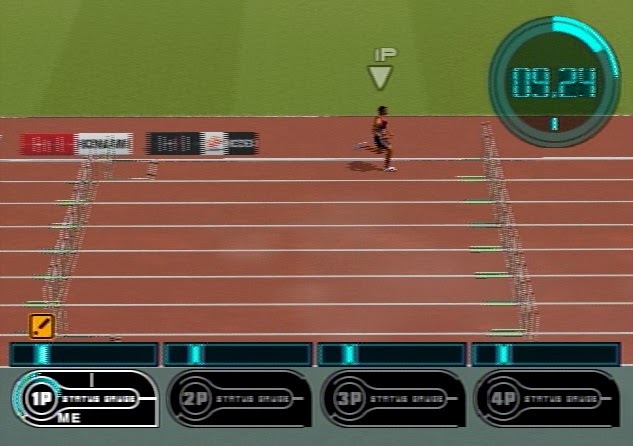 Yep, it's the same thing as the 100m dash, except now you have to press L1 at the right time to jump over hurdles. If you were using two hands to mash buttons on the last challenge, you're going to be screwed when it comes to this one because you won't be able to reach the L1 button. Good luck with that. Once again, you have to mash to run and press L1 to jump at the right time. But in this one, you have to hold L1, then release it with good timing to determine the angle of your jump. Somehow, despite the simplicity, it manages to feel awkward at the same time. Don't be deceived! 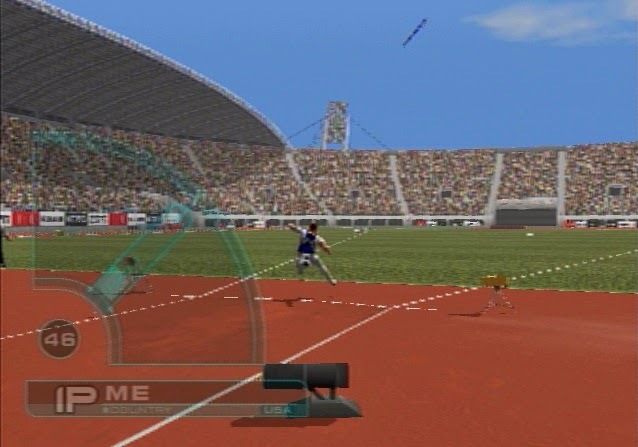 The HUD may look different, but this is essentially the exact same game as Long Jump. But now, instead of jumping with L1, you... do some unclear pole flex with it. It doesn't really matter though, since all you need to watch is the bar on the side of the screen. Oh yeah, you can also set the height you want to attempt before you start. Not that you'll know what a good height is or anything. Did you know that my friend's grandma throws a javelin!? Well it's true! 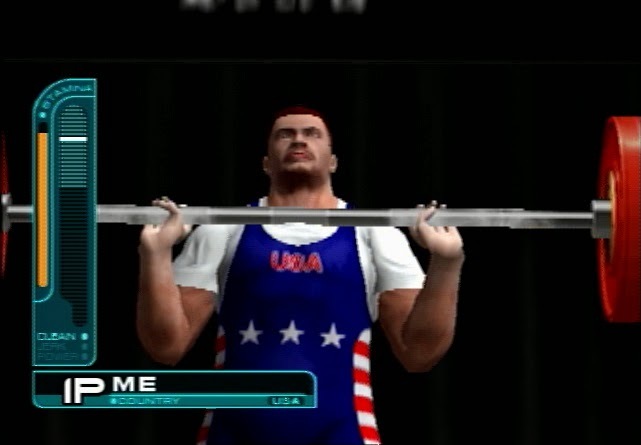 Anyhow, in this game we'll be breaking some new ground by pressing up and down after our mashing run-up. As you mash, this thing showing the angle of your throw goes up and you have to tap down to bring it back down to where you want it. When you're ready to throw, press up - but not too late like I did in the screenshot to the left! 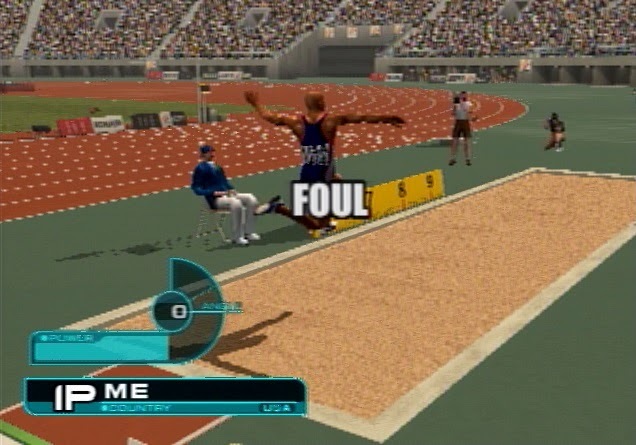 That'd be foul. For this minigame, you'll be playing as a WOMAN. Because swimming is a GIRLS' sport. And because the developers wanted to animate WOMEN in BATHING SUITS. Also, now you'll be mashing L1 and R1 instead of X and O for some reason. At least those buttons make sense though since you don't have to re-position your hands at all. Now here's a manly sport for men who want to prove how manly they are by - you guessed it - mashing buttons. In between mashing sessions, you also have to stop the power meter in the blue zone at the top a couple times with good timing. 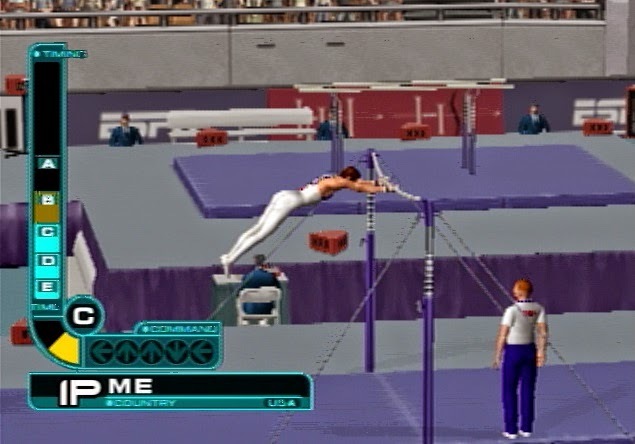 Like the pole vault minigame, this one allows you to choose the weight you want to attempt. Heavier weights have smaller timing windows. Also, it's important to note that this minigame has the funniest animations out of all of them. At last, we've made it to the relatively unique and enjoyable events. No more mashing, just pure timing and reflexes. Here, there's a meter that goes down which you'll have to stop in one of the five areas. Each time, a different region will flash, so you have to react quickly and accurately to stop it in the flashing region for best results. After stopping it, you aren't quite done, because you then need to quickly enter five directions in order. This repeats several times and then you're done. You know the phrase, "shut your trap"? Well, it actually originated from this event. "Shoot" was misheard as "shut", and "trap" is another word for "mouth" since mouths act as spider traps while you're sleeping. ...okay, I made all of that up. Anyway, if you're any good at FPS games at all, this minigame will be a breeze. 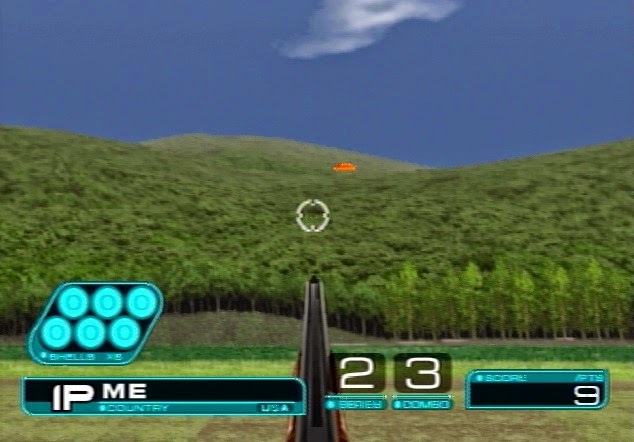 Graciously, the game allows you to invert the controls if you so wish and then you just shoot a bunch of clay pigeons that fly up at random. It's simple, but after the other minigames, it's at least a little fun. Anyway! This works as you'd expect. 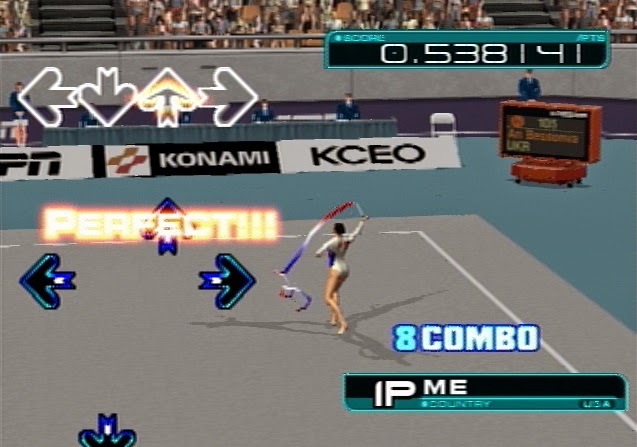 You push the D-Pad and/or four buttons on the right side of the controller as the arrows match up with the outlines at the top. There are three songs to choose from of varying easy difficulties (at least for someone who's played similar games before) with one unlockable "expert" song. Also, each song has a highlighted part in the middle which determines the success of your special move. Sadly, this is probably the most fun event of the bunch. And there they are. You can go for records on each event and also earn gold medals, which apparently unlocks "funny sound" if you get them all. Even going for all gold medals would probably take no longer than an hour and a half though. So, there you go. Don't bother playing this game unless you need a $1 PS2 game on CD (as opposed to DVD) to swap out for your foreign CD games, as I did. If you're into crappy games, you should check out the Taco Bell Doom clone I reviewed.